Architect William Van Alen’s original design for a new skyscraper in 1929, positioned in the heart of New York City, began as a speculative venture. It was so advanced and costly that the project’s developer, William H. Reynolds, objected to the plans. The entire design, leases, and architectural plans were then sold to Walter P. Chrysler, who worked with Van Alen to revise the plans and add additional stories. Walter Chrysler, the chairman of the Chrysler Corporation wanted to iconically identify the building as the headquarters of his automobile company. 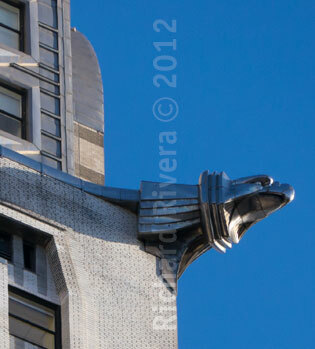 It was for Walter Chrysler that Van Alen added the stainless steel eagle’s heads and Chrysler radiator caps as architectural details. The Chrysler Building is a masterpiece of Art Deco style and was the World’s Tallest Building for only four months in 1930 until it was surpassed by the Empire State Building. The building was declared a National Historic Monument in 1976. The 21-story neo-classical American Express Company building was constructed between 1916-1917, and was designated a New York landmark in 1995. The H-shaped plan of the building, with two connected tall towers was designed to provide offices with the maximum amount of light and air. 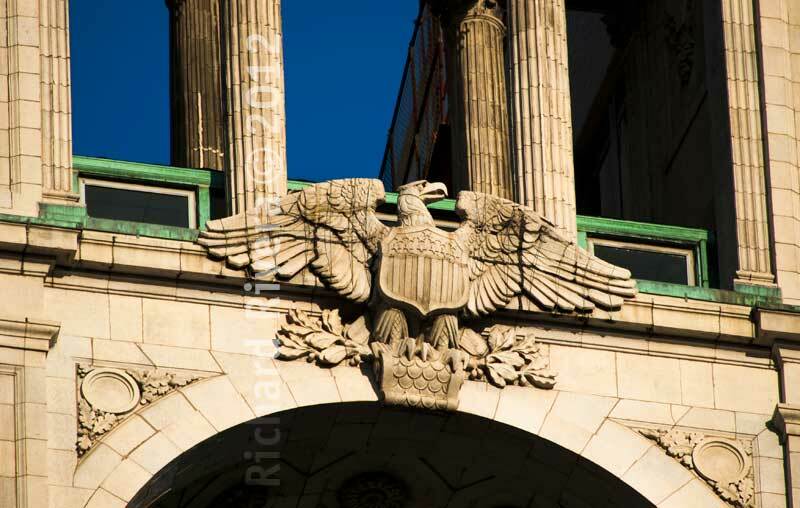 Of note is the facade at the 20th and 21st floors on both the Broadway and Trinity Place sides, which has a two-story colonnade bridge supported by an arch with an enormous terra-cotta eagle. 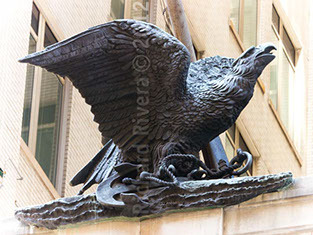 And three-stories above the entrance of 65 Broadway there is a wonderfully defiant bronze eagle (the company’s insignia) installed in 1977, astride an anchor and standing in the surf of waves.